Last week four of our network leaders met in the rector's den within the walls of the infamous Redcastle at St Kevin's College. Who knows how many rectors, Christian brothers and trustees or students have met there in the past, in a room steeped in history and tradition. This time, Nicky (Weston), Jenny (St Joseph's), Sean (Papakaio) and Paul (St Kevin's) came together to discuss the way forward for our vibrant, future focused Learning and Change Network. Each of us are genuinely passionate about the personal and professional growth that has occurred as a direct result of working as a family of four schools. Most importantly, our students are thriving and excelling within the environments that have evolved . 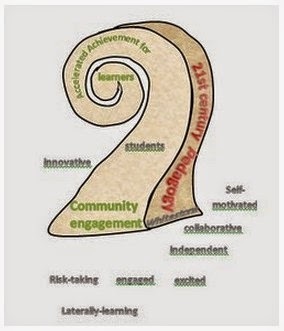 We firmly believe that the LCN is the catalyst for the energising learning communities that abound in our schools. We are living proof that school environments and communities, steeped in tradition can evolve into authentic student led entities that are open to embracing motivational forward thinking learning and change. This passion must exist to drive the network forward and sustain future growth and innovation. Each of us have had personnel change within our schools with sabbaticals and promotions. But we have sustained our network and the unified collegiality is propelling us further forward. Recent reflections on the impact of the LCN for the Milestone 6 report have helped us to realize that we must continue together. Other local schools have indicated interest in our learning and we warmly welcome them to join our LCN. We are eager to share and collaborate for the benefit of all students across the network. Expectations for the Milestone 6 report due 15th May. Being invited to share learning at the National Hui in Auckland in July around network sustainability will be an exciting opportunity for Nicky and Jenny. We are all adamant that network sustainability must be driven by passion, innovation, inspiration & collegiality. Our change priorities of student agency, parent engagement and transition continue to be the focus for our work. Next week, staff from all of our schools will come together to listen to Year 8's share what's important for them in their learning. There will be powerful messages for the high school staff, just as there were when the Year 9's shared their views during our last combined meeting.